One of the primary marketing steps for any website is to get traffic to it. Your tutoring business will grow if you can get people to your site, and connect with what they are looking for. But how do we increase traffic? There are a number of different approaches but at a high level, there’s really only 3 options. But how do we go about doing this? Here are four unique and unusual ways to borrow traffic from other website owners. Borrowing traffic usually includes partnering with other website owners to refer traffic to each other. Referred traffic is the BEST and highest quality traffic you can get. One of the most obvious ways to growth hack traffic is to simply trade links with other website owners. You put their link on your website and they will put your link on their website. You obviously want to trade links with someone who has a comparable website, like another tutoring service, that shares a similar topic and target demographic. In the past, websites did this by setting up “link directories.” You can still do this, but focus on fewer and more quality partnerships. You can place your links in a “Our Partners” or “Our Tutoring Friends” area, much like WordPress has a “blogroll” area. Swapping ads in newsletters or banner ads on your website is a VERY effective way to borrow traffic. Referral traffic from partners can generate large profits and lead generation. You can start out by purchasing ads to start generating traffic to your site, get them to join your mailing list, and then once you have a couple of thousand people on your list, start swapping ads with others for free. All you have to do is ask. 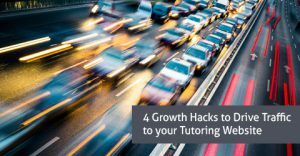 Find other tutoring services or business owners that have email lists and you’ll be amazed at how many of them will agree to swap ads with you. One marketer grew their list to several hundred thousand by just swapping ads on other people’s thank you pages. Heck, you don’t even have to swap ads. What this marketer did was he created a high quality product and gave it to people to put on their thank you page as a free giveaway. Thank you pages are one of the most valuable pieces of property you have on your website. People look at them. You can even do a “co-registration” ad swap by offering another person’s email newsletter on your thank you page and via versa. Another marketer took this strategy and mastered it. The results were sales over $800,000 in affiliate commissions in his first year in business. All he did was swap ads in people’s auto-responder systems (follow-up email sequences). So in other words, he would insert his swap partners ad in, let’s say, the 5th email in his auto responder. And his swap partner would insert his ad in, let’ say, his 6th auto responder email. Now, every person that sees that email will be exposed to his ad and vice versa. These strategies are not a fit for everyone, but initiating one of these growth hack strategies and focusing on it could substantially increase your website traffic.